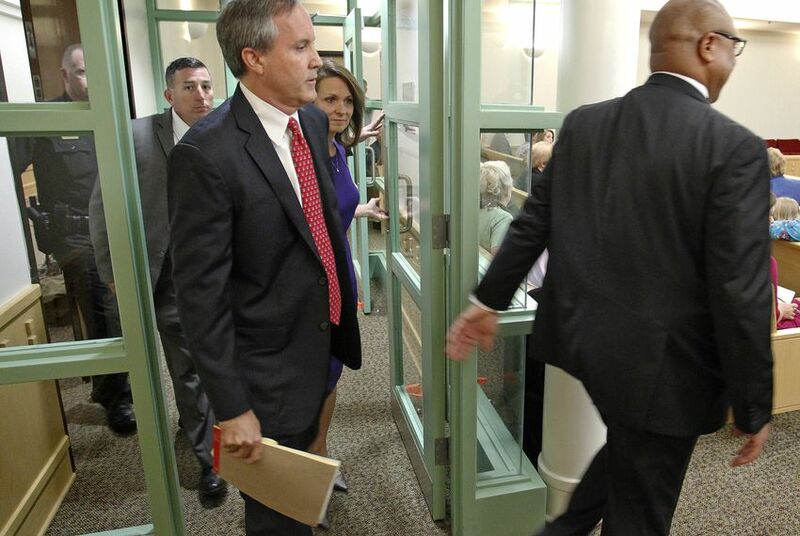 Attorney General Ken Paxton's first courtroom appearance as a criminal defendant was a 30-minute affair during which Paxton's lead lawyer quit for unspecified reasons, the attorney general insisted no cameras be allowed at his trial and the judge admonished everyone to limit public statements about the case. FORT WORTH — Texas Attorney General Ken Paxton's first courtroom appearance as a criminal defendant was a 30-minute affair in which Paxton's lead lawyer quit for unspecified reasons, the attorney general requested that no cameras be allowed at his trial and the judge admonished everyone to limit public statements about the case. Paxton was in a Fort Worth courtroom on Thursday for the initial hearing in his financial fraud case, pleading not guilty to three felony charges related to claims that he misled investors in business dealings before he took office. During the hearing, Kendall indicated Paxton had retained Dallas-based lawyer Pete Schulte as counsel, appearing to contradict what the attorney general said about not having a lawyer. Gallagher also confirmed that Schulte had told him that he should be included on communications about the case. Asked about the discrepancy, Paxton said he meant that he had not yet formally brought Schulte into the case as a lead attorney. Later that morning, Schulte tweeted that “clarification will be forthcoming today” about who would be representing Paxton. “It’s unfortunate that Joe Kendall created this confusion in court as he was leaving the team,” Schulte said. Special prosecutors Brian Wice and Kent Schaffer greeted the defense’s changing counsel with skepticism. Telling the judge they would not raise a formal objection “this time,” Schaffer pointed out that Paxton was on his “third lawyer in as many months.” He said that he hoped the pattern did not become a stalling tactic. A Collin County grand jury indicted Paxton on two first-degree and one third-degree felony charges in July. Paxton allegedly persuaded two investors to buy at least $100,000 worth of stock in technology firm Servergy without disclosing that he would be compensated for it, according to court filings. The McKinney based company is the focus of a separate U.S. Securities and Exchange Commission investigation into whether it defrauded investors with false claims about the sales of its data servers and their technological capabilities. Paxton and his defenders have sought to portray the case against him as a political witch-hunt driven by publicity hungry lawyers. "I am innocent of these charges. It is a travesty that some would attempt to hijack our system of justice to achieve political ends they could not accomplish at the ballot box. Regardless, I will continue to serve the people of Texas as Attorney General and continue to fight for the freedoms guaranteed under our Constitution," Paxton said in a prepared statement. On Thursday, about a dozen conservative activists including NE Tarrant Tea Party President Julie McCarty and Texas Eagle Forum President Cathie Adams, as well as state Rep. Bill Zedler, R-Arlington, attended the hearing to support Paxton. “There are thousands of people around this state who not only voted for Ken Paxton but are today down on their knees praying for him because that is the kind of caliber of man he is,” said Adams, who sat next to Paxton's wife in the courtroom's front row. When Paxton does finalize his legal team, it will have plenty to review. Wice and Schaffer said they have scanned more than 14,000 documents onto CDs to make available during the discovery process, and expect to scan another 8,000 by the end of the month. According to the deadline the judge set Thursday, Paxton’s team will have until September 30 to file legal challenges to the indictments. During the hearing, Paxton also requested that cameras not be present for a jury trial. No electronic devices or cameras were allowed in the courtroom for the hearing. “We want this case tried in the courtroom, not the press,” Kendall told Gallagher. The judge said he agreed with that sentiment, and reminded all parties in the case that they were under strict orders to abide by the state bar’s professional code of conduct regarding publicity. But he also stressed that it would be up to him whether cameras would be in the courtroom during the trial. “That’s my decision,” he said. Correction: This story originally attributed quotes to attorney Brian Wice that should have been attributed to his co-prosecutor Kent Schaffer.